The Samsung Galaxy M20 is going to launch in India on 5th February, 2019. The device comes with a 6.3-inch full HD+ which depicts resolution of 2340 x 1080 pixels. Its display comes with Infinity-U feature which means the notch on the top is u-shaped. The handset is powered by an octa-core Exynos 7904 processor that is coupled with Mali-G71 GPU, 3/4GB RAM and 32/64 GB default memory capacity which is expandable up to 256GB. As far as cameras are concerned, the handset sports a dual-camera setup at the back with a 13-megapixel primary sensor and a 5-megapixel secondary sensor. At the front, the phone is equipped with an 8MP camera. Connectivity options on board the Galaxy M20 include Wi-Fi 802.11 b/g/n, hotspot, v5.0, microUSB 2.0, with A-GPS, GLONASS, and dual Sim. The handset is powered by a non-removable Li-Ion 5000 mah battery which supports fast charging technology, and runs Android 8.1(Oreo) out of the box. It uses a new Samsung Experience version 9.5 UX user interface. Sensors include a Fingerprint, an Accelerometer, a Gyro, a Proximity, and a Compass. The handset is available in the Indian market in Blue and Black colors. The Samsung Galaxy M20 is priced at Rs. 10,990 for 3GB and 32GB variant and Rs. 12,990 for 4GB and 64GB variant. Samsung Galaxy M20 new firmware update improves charging speed. The update bumps the current firmware build of the Galaxy M20 to M205FDDU1ASD1. Samsung Galaxy M20, M30 goes on flash sale today in India. Galaxy M30 smartphone carries a price tag of Rs 14,990 for the 4GB RAM with 64GB onboard storage variant and Rs 17,990 for the high-end variant with 6GB RAM and 128GB internal storage. 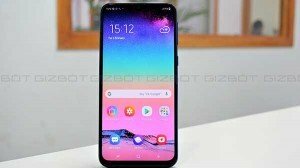 Samsung Galaxy M20 firmware update with latest Android security patch released. The new update which is released for the Galaxy M20 smartphone comes with a firmware build M205FDDU1ASB4, M205FODM1ASB4, and M205FDDU1ASB4. Samsung Galaxy M20 flash sale going live today on Amazon.in. As a part of the flash sale, users will be able to avail complete damage protection plan for Rs 1,199 along with no-cost EMI offers for up to six months.